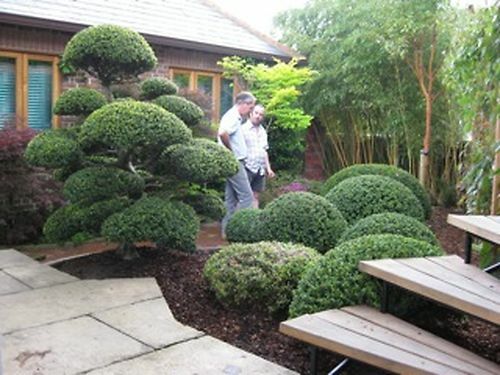 Architectural Plants nurseries are located near Horsham and near Chichester in West Sussex and specialise in plants that are both shapely and exotic - Japanese and European Topiary, hardy palms, bananas, bamboos, plants for screening, and a huge range of rare evergreen trees. They are the home of the interesting, unusual, quirky and bizarre - the tropical and the jungly, of both big and small specimen plants. Winners of a number of awards for their innovative approach and high level of presentation. The Antidote to Garden Centres. They use our ladders on the nursery, in their show garden, and also in their newly formed Creative Maintenance Department. They also sell the ladders, and a range of our pruning tools. Jake used to work there too. "um, ur, ur, um.......the single most revolutionary piece of horticultural equipment to come on the market for years - it opens up possibilities previously only available to owners of JCB teletrucks and giant hydraulic cherry pickers. It's this idea that if you make a job easy it'll get done - if you make a job difficult, it probably won't. The 12' ladder makes certain quite ambitious jobs easy that would hitherto have been bloody difficult and probably quite dangerous. Clipping Cupressus to 15 ' (just), clipping a stilted hedge (or any hedge for that matter) to 13' (easily) or clipping a substantial mushroom tree with a full standard trunk (pretty easily) or removing old flowers and leaves from enormous old Cordylines by standing right on the top rung and hanging on to wobbly branches" (actually we don't recommend you stand on the top step). They use our ladders on the nursery, in their show garden, and also in their newly formed Creative Maintenance Department. They also sell the ladders, and a range of our pruning tools.